The connection of the Haftorah to the Parsha: The Parsha opens with a discussion of the daily Menorah lighting in the Mishkan (Tabernacle) and Temple. The Haftorah speaks of the vision of the Menorah and an Angel’s prophetic interpretation of that vision. The Menorah built by Machon Hamikdash in Israel, which is on display in the Cardo in the old city of Jerusalem. The storyline of this week’s Haftorah: The Haftorah begins as Bnei Yisroel are returning from exile. They are returning from the land of Persia to build the second Bais HaMikdash, their holiest of sites. Their initial sense of euphoria is shattered when they encounter the site of their Holy Temple and find only rubble and ruin. Zechariah dispels the gloom from his disheartened brethren by shouting, “Rani V’simchi Bat Zion” – Sing and be glad daughter of Zion, Jerusalem, we are returning home.” Zechariah is telling Bnei Yisroel to rejoice, that the Holy Temple will be rebuilt and restored to its former glory. They should celebrate because they will once again stand in the presence of Hashem and this is an opportunity that many did not receive. He goes on to say that the Nations of the world will join the ingathering and celebrations. The second part of the Haftorah discusses how Satan was accusing Yehoshua, the Kohen Gadol (High Priest) of not rearing his children in the proper Torah manner (two of his sons intermarried). The angel of Hashem comes to Yehoshua’s defense and refutes the allegations. The angel then goes on to encourage Yehoshua to remain steadfast in his service to Hashem. 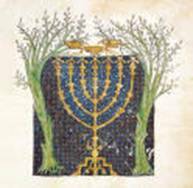 The third and final part of the Haftorah talks about Zechariah’s prophecy concerning the Menorah. He sees olive tress draped over a Menorah and begs to learn its interpretation from the angel. He is answered that only through Hashem’s spirit would the people be saved, not through army might. The meaning of his name is “Hashem remembered”. Zechariah ben Brachia Ido was a Kohen. His prophecies took place around 520 B.C.E., approximately 2500 years ago. He is the 11th of the 12 prophets in the Book of Tray Assar. Zechariah wrote his own 14 chapter book. Shortly after Zechariah’s time prophecy departed from Israel. Lived in Jerusalem, during the time of the return from Babylon and Persia. Darius, (according to some) the son of Esther & Achashverosh permitted the rebuilding of the 2nd temple. He was buried in the Kidron Valley. Was a member of the men of the great assembly (Anshay Knesset Hagdolah). His peers were Zerubavel, the governor of Jerusalem, Yehoshua the Kohen Gadol, Mordechai, Nehemiah, Ezra, Chaggai, and Jonah. Zechariah hid the temple treasures, so that the holy vessels would not be used. Famous Phrases: Zechariah 14:9: “V’haya Hashem l’melech al kol ha’aretz bayom hahu yeheyeh Hashem echod ushemo echad.” And Hashem will be the ruler over the world. This phrase is the concluding sentence of Alenu Leshabeach. Haftorahman’s lesson of the week: We can learn from Zechariah, to be visionaries. When things seem bleakest, think positively, encourage others that better times will come. Map: Zechariah’s prophecy takes place in Jerusalem.